Quote Of The Day - Yahya Jammeh - Joe.My.God. 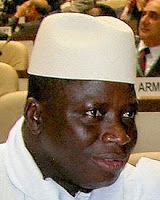 RELATED: In 2008 Jammeh announced that he would “cut the head off” any homosexual found in Gambia. He then ordered all gay people to leave the country because his anti-gay laws would be “stricter than in Iran.” At one point he had multiple wives, but reports conflict on how many he may currently have.